AT&T on Tuesday began its second round of iPhone 4 orders, giving walk-in customers who didn't preorder through the wireless carrier their first opportunity to purchase Apple's latest handset. 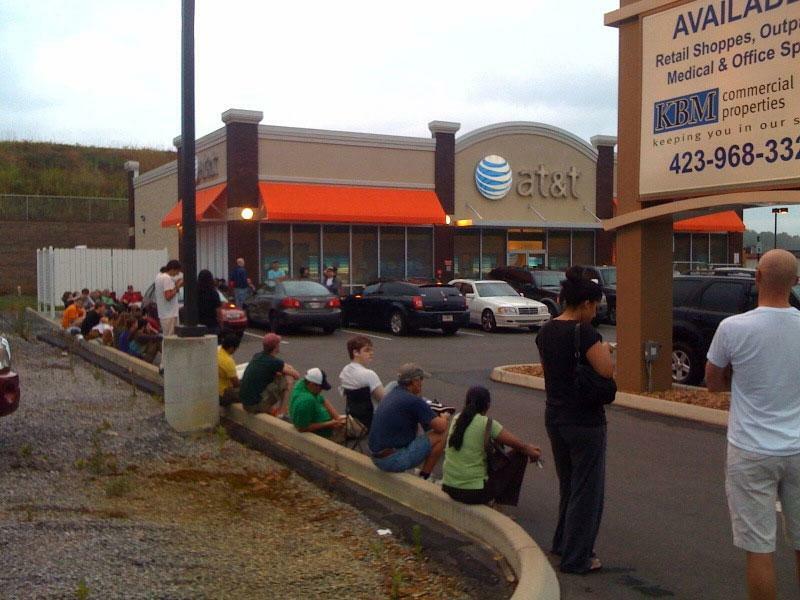 Customers around the U.S. got in line once again for the iPhone 4, following last week's first day of sales. But while Apple's retail stores had some phones available for customers who did not preorder, AT&T was forced to suspend preorders after experiencing overwhelming demand earlier this month. The first day of preorders —June 15 —was said to be the busiest online sales day in AT&T history. AT&T later announced that those who initially preordered would receive their iPhone 4 last week, while customers who were unable to get in before preorders were suspended would have to wait until June 29. Starting Tuesday, the iPhone 4 became available on a first-come, first-served basis while supplied last at all AT&T sales channels. The handset is available through the wireless carrier's retail locations, at its website, and in business sales channels. As inventory of the iPhone 4 sells out, AT&T, the exclusive wireless carrier of the iPhone in the U.S., offers customers the option of purchasing Apple's handset and having it delivered to a home, business or AT&T store. Customers will receive an e-mail when their order is placed, and again when it finally ships. Photo via Flickr user thinkjose. In other AT&T news, the company announced this week that it has completed its overhaul of its high-speed 3G network in New York City, throughout Manhattan, the Bronx, Brooklyn and Queens. The upgrade is said to offer customers improved G voice and data connectivity performance, especially during peak hours. Through the upgrade, AT&T added new layers of frequency to nearly all cell sites in Manhattan, as well as many other areas in the Bronx, Queens and Brooklyn. The upgrades were necessary as AT&T's network grew more than 5,000 percent over the last three years since the iPhone first launched. "Our goal is pretty simple: in the city that never sleeps, we're working 24/7 to make sure our customers have a great experience every time they make a call, check e-mail, download a song or video, or surf the Internet on their AT&T device," said Tom DeVito, vice president and general manger for AT&T in NY and NJ. "Adding more capacity to cell sites is just one way we are doing to that."